Here’s a photo I dug up while searching for baseball pictures through the Library of Congress photo archive site. 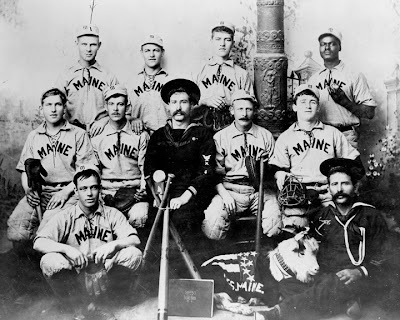 According to the short caption, these men were all members of the USS Maine’s baseball team. The caption remarked that all but one of the men were “blown up in Havana.” Interesting piece of history. Anyone curious about the guy in the top right? I didn’t think any integration of the military occurred prior to the Korean War.